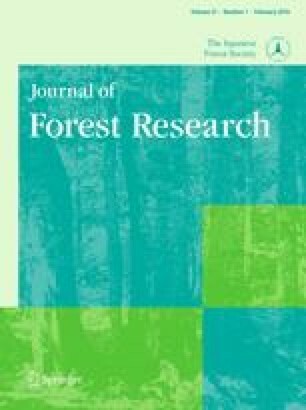 The effects of temperature on the growth characteristics of a Japanese willow (Salix gilgiana Seemen) were studied with respect to dry matter production, wood anatomy and the net photosynthetic rates of leaves. Clonal materials were grown in natural-light rooms (phytotrons) at 30°C/25°C, at 25°C/20°C or at 20°C/15°C (day/night: 12 h/12 h), respectively. The elongation rate of shoots from the beginning of June to the end of July was approximately 22 cm per week under the three different sets of conditions. The shoots reached approximately 3 m in height after 4 months of growth. Total dry matter production and dry weights of stems did not differ very much among the three sets of temperature conditions after 9 months of growth. The dry weight of leaves increased at high temperatures while that of roots decreased. The number of vessels increased significantly at 30°C/25°C and 25°C/20°C, whereas the diameters of vessels and fibers, and the double wall thickness of fibers did not vary markedly under all three temperature regimes. The net photosynthetic rate and the respiration rate in mature leaves were highest at 30°C/25°C, and both activities increased with increases in growth temperature. The increase in the photosynthetic rate was much smaller than that in the respiration rate. Individual plants had been completely adapted to the respective growth temperatures, as judged from the decrease in the photosynthetic rate after the transfer to different temperatures. Part of this work was reported at the 102nd Annual Meeting of the Japanese Forestry Society (Nagoya, Japan, 1991). This work was supported by Grants-in-Aid (Integrated Research Program for Effective Use of Biological Activities to Create New Demand) from the Ministry of Agriculture, forestry and Fisheries of Japan (BRP 97-IV-B-10).